So, guys, I missed my six month anniversary on here. I was going to do something special, but I don’t know what, and now I’ve missed it anyway. But one thing I didn’t miss this year, which is enough of a celebratory event that coincides with my blog’s six month anniversary, is entering the AMAZON BREAKTHROUGH NOVEL AWARD contest. I have been trying for about four or five years to enter this contest, and somehow I miss the submission deadline every year. But not this year. Unfortunately, I’m sharing this too late for anyone else to read this and decide they want to enter, too. But perhaps you were all aware of it already, and more on top of things than I am. If not… Sorry to spread the word just past the deadline. Heh. I realize there’s probably not a huge chance of getting all that far in the competition, but hey, I JOINED. If I didn’t, I would always wonder. Now I don’t have to, and I know how (to join), and I can do it with ease every year. One day, maybe I’ll have a book finished that happens to be winner material. Who knows! In the meantime, here’s to six more months of blogging and new milestones! Categories: Self-Publishing, Writing | Tags: AMAZON, Amazon Breakthrough Novel Award, Arts, author, book, books, Contest, milestone, self-publishing, write, writer, Writers Resources, writing | Permalink. 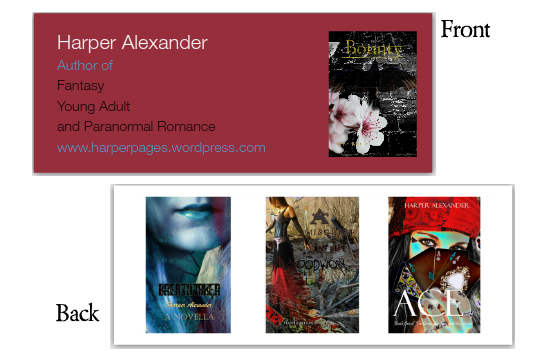 So my author friend J Weaving (whom you’ll be hearing a lot more about nowadays) and I have decided to try putting out some business cards to spread the word about our books. Who knows how successful that kind of thing is for authors, but if nothing else it’s been so much fun designing the cards, and it will be nice to have something to hand to friends/relatives (or strangers you simply happen to talk to) when they ask about your writing and your books. Some authors really love talking about their work, but for me the subject is a little daunting and, to be honest, wearying. They throw questions at you like ‘what’s your book about?’ like it’s easy to just spit out everything that makes it (hopefully) worth reading. They’re merely curious, but the pressure to make your work sound good (or at least worthwhile) rather kills the casual ease of it for me. Maybe it’s easy and enjoyable for some of you writers, but for me there’s so much intertwined that makes a book ‘special’ that it’s not an easy question for me to answer to begin with. As such, I’m notorious for answering ‘what is your book about?’ with the response ‘ummm…it’s about a girl…’, and then sort of trying to salvage it from there. SO. I am excited (okay, I’m RELIEVED) to finally be developing some business cards, so I can just say ‘well, here, why don’t you check it out’. Saved! I’m doing these on Moo.com, per my author friend’s referral, but I also know you can do the same thing on Zazzle.com, here: Create Your Own Zazzle Business Cards! Categories: Self-Publishing, Writing | Tags: author, book, books, business, Business card, cards, indie, promote, promoting, promotion, self-publishing, write, writer, writing | Permalink. I just have to write a quick post to say – does anyone else have as much ridiculous fun creating/practicing a signature for an author autograph?! (At first, I just wrote ‘authograph’, then fixed it, then realized how fitting it would be in hindsight). I just have way too much fun practicing my autograph, at least until I remember I’m an indie author and that it’s total overkill, and that I’ll probably only get to sign a few books in my lifetime. But it’s so much fun! I get pretty carried away. 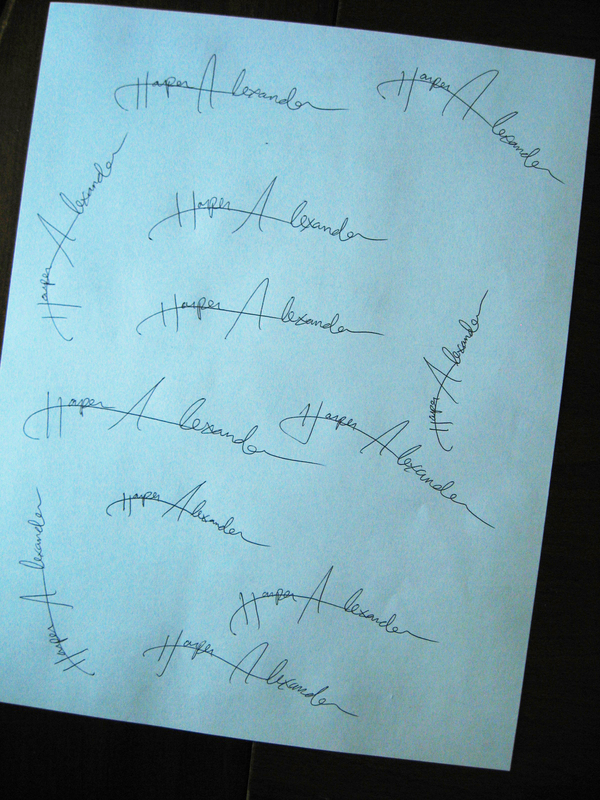 I’m curious, for those of you who use your regular name and not a pen name, do you use your regular signature? Or create a special autograph-worthy signature? Or have you even thought that much about signing books at all? Categories: Books, Self-Publishing, Writing | Tags: Autograph, book, self-publishing, signature, signing, write, writer, writing | Permalink. 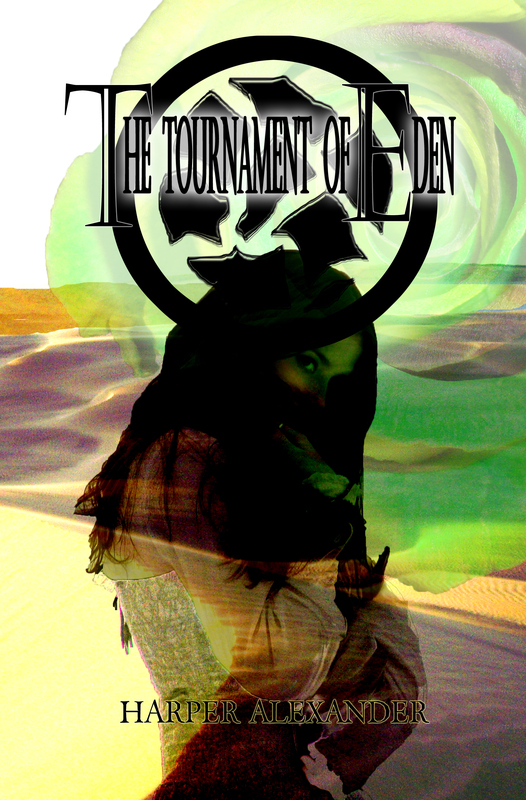 Just finished creating the cover for The Tournament of Eden! Touch-ups may occur, but this is pretty much it! (I’m currently only about a third of the way through writing the book, but sometimes I need the image of the finished product to motivate me.) I love it! 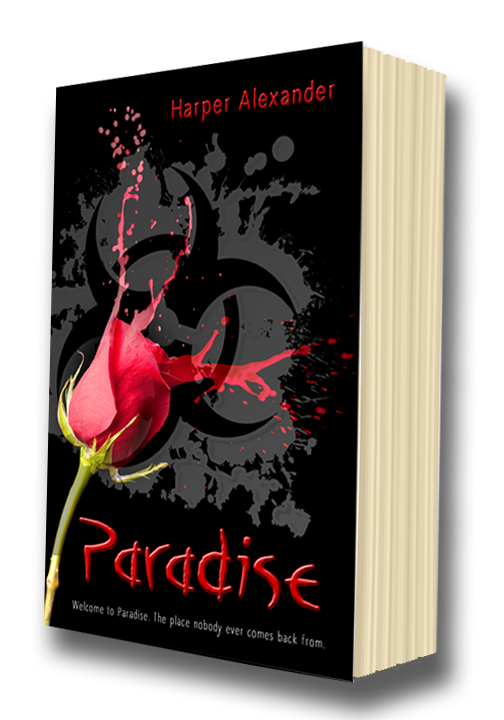 Categories: Books, My Books, Self-Publishing | Tags: art, Arts, book, cover, fantasy, fiction, manipulation, photo, photomanipulation | Permalink. I’ve been focusing mainly on my YA novel ‘The Tournament of Eden’ lately, but for the times when I’m burnt out on that I decided to go ahead and let myself work on an alternative project simultaneously. I have a number of stories (sequels and such) that need to be worked on, and they’re certainly queued for progress as soon as I have the proper inspiration, but since said proper inspiration hasn’t struck me yet, I’ve gone ahead and started something new, because I WAS stricken with the inspiration for it. Sometimes, like it or not, that’s just how it works. So long as I don’t get TOO offtrack and forget queued works entirely, I’m getting to a place where I’m okay with letting inspiration run its desired course. So, that being said – onto more relevant introductions! My new story, which I intend to craft as a novella (but THAT often changes) is called Crooked Bird. It’s a more lyrical, ‘rich’ sort of narrative than the easy-read adventure I’ve been having fun with for The Tournament of Eden, and I think I need this type of project to keep my dreamer’s soul properly fed. I’ve gone back and forth between these two writing styles a LOT, trying to find my niche, but the truth is I really enjoy doing both, so both it is! I had heard rumors of the place same as anyone growing up. The kind of gnarly echoes that frighten a child, but fade into perspective as a twisted sort of therapeutic chatter that defines their real core, as you realize with age you live in a time where story – any kind of story – is the best escape anyone can seize. I was born the day before the war ended. A rosy-skinned symbol of hope, wet with life, as so many ashen-skinned heroes lay in the same wet that, for them, meant death. You could say only one day of my life was flavored with the war-torn salt that rained on the wounds of that generation, but I bear something greater than a wound because of it. I bear an emptiness, because of the father the war took from me, before I ever knew him. Sometimes I think I can remember being born, and that my cries had nothing to do with leaving the warm cocoon of my mother’s body and everything to do with the fact that I knew – somehow I knew my father was dead, and I grieved for him as my first awareness. I never told my mother that I felt this connection to him. What was I to say? ‘When I cried coming out of the womb, it was because I knew my father was dead, and grieved for him’? I never had the opportunity to tell her, anyway. For she was stricken by the emptiness far more severely than I was, and paid attention only to the window after my birth, as if she were so fragile that she had to put herself in a glass case, or at least the illusion of one. I knew my mother’s face only by the pale reflection of it in that pane, always staring out at the stubby forest of chimneys that sprouted from the rooftops of Slateburrow Street. What did she find in those chimneys? Did she numb her mind tracing the abrasive mortar between bricks with her conscious? Did she see visions in the chimney-smoke? Did the clusters of brick begin to blur after staring at them for so long, shifting behind tricks of smoke until they took on the shapes of gargoyles, becoming entrancing, frightening sentries that kept her rooted there? I used to wonder this, as a wispy-blond child, freckled with innocence and awe, because I had woken from many a nightmare and turned away from the frightening shadows of my room only to find myself staring out the window at those very same chimneys, and mistaking their dark shapes for gargoyles myself. Later, when I got older and gained a notion of bravery, I began to sneak out onto the rooftops at night and paint pretty pictures on those chimneys so my mother would have something pretty to stare at, and to be sure they couldn’t be mistaken for gargoyles anymore. I spent a good three years of my young life dedicated to this cause, a nightgown-clad cherub-saint growing up on moonlight and paint fumes, the chafe of off-shoulder lace against the downy goosebumps of my skin and the slate-brittle shrapnel of shingles beneath my feet. It was an unorthodox childhood, to be sure, but at least I was putting myself to good use. Unlike those who spent their days staring into nothingness or dumping bottles of spirits down their throats as if to replace the spirit that had died inside them. Unlike the ones who gave themselves mindlessly to story and fantasy and the gossip of everyone else’s life but their own in order to escape reality, which was the most prominent fad of all. Dothame’s opera houses, libraries and gossip parlors were like anthills in those days, dedicated streams of legs always going to and from. Often, the legs ambled with a limp, or weren’t a pair of legs at all but one limb of flesh and blood and one imposter, made of wood or innovative synthetic material or something entirely more questionable. Questionable, of course, only because the story-happy population of Dothame latched onto the irresistible opportunity to twist reality into something different; namely, in this case, the perfect theme for a new kind of speculation about the place. The Place being that infamous, savagely-mystical isle across some impossibly hidden ocean, where devil tribes and bestial herds are said to roam, and all manner of unnatural things are bred and born and never beheld. Legends of this place preceded my time by many generations, but the missing limbs gave it a new angle. A trick of shadow as a man’s trench coat flared wide about his deformity, or a particularly unnatural limp, was all it took for the story-mongers to start the rumor-mill churning, speculating about how so-and-so’s peg-leg looked a little more bestial than wooden, and about some ridiculous black market of limb concocting and trading going on between our city and the strange, fantastical isle across that hidden sea. My best childhood friend, Leea, prided herself in being one such story-monger, always going on about some new glimpse of iridescent feathering about a man’s ankles or elephant-like hide where the flesh or boot of his calf ought to have been. And of course, she never had an answer at the ready for that. Categories: Books, Excerpts, My Books, Writing | Tags: Arts, book, excerpt, fantasy, fiction, literature, Online Writing, write, writer, writing | Permalink. Oddly enough, I didn’t have an answer. I actually couldn’t remember if I ever give first-person narrators separate italic thoughts or not. And I still can’t. To find out, I’m going to have to go back and re-read my first-person books, because I feel kind of like I’ve done both, but I can’t actually recall an example. I started to tell my friend that I think it depends on the personality and voice of the character, for me, and that I think I’ve done it some in some books and not in others, but then I just couldn’t be sure. So that leads me to wonder where everyone else stands with this. Has anyone else ever actively thought about this? Is there any kind of rule that dictates whether or not it’s allowed or not allowed or just a big gray area? I’m interested to know. Categories: Writing | Tags: author, first person, friends, narrative, write, writer, writing | Permalink. And this thing is…a little site called Swagbucks! Some of you may have heard of it. Basically, you sign up with Swagbucks and simply use their search engine for whatever searches you would regularly do in your daily internet browsing anyway, and you earn ‘swagbucks’ by doing so, which can be redeemed for either cash or gift cards and other prizes. This is something I signed up to do a long time ago, and I’ve been doing it ever since. Where is the book-related part in this, you ask? Well, the first place I heard about it was in a forum post on Amazon.com, and someone ELSE was sharing the info because one of the commonly sought-after prizes is Amazon gift cards! So, I signed up right away under the allure of stocking up on Amazon gift cards, which, to me, basically conjures up the image of opportunities for free books! Some of you may not be interested in these types of things, but I’ve actually found Swagbucks to be one of the best rewards sites I’ve ever been involved with, and I have redeemed for countless Amazon gift cards, which have provided countless free books over the past few years! Needless to say, this is the type of thing that makes me very happy, and I think everyone should be doing it. There are also many other ways to earn through Swagbucks besides the search engine itself, if you care to get really involved. But the main thing is just that you get in the habit of ignoring the url box in your browser and typing addresses into the search box instead, and simply clicking on the results to get to where you’re going. I do this with everything from Facebook to Yahoo to Google to WordPress, and on down the line. If you’re interested, please do sign up through this link: http://www.swagbucks.com/refer/Lolobear (or the referral banner displayed at the bottom of the lefthand sidebar of this blog). Happy searching! Categories: Uncategorized | Tags: Amazon.com, earn, freebie, money, online, program, rewards | Permalink.